Here are a list of peer reviewed articles from WISSARD and other research projects. Publications from SALSA will be updated when available. Michaud, A. B., Dore, J. E., Archberger, A. M., Christner, B. C., Mitchell, A. C., Skidmore, M. L., Vick-Majors, T. J., Priscu, J. P. (2017), Microbial oxidation as a methane sink beneath the West Antarctic Ice Sheet, Nature Geoscience, 10, 582-586, doi:10.1038/ngeo2992. Siegfried, M. R., B. Medley, K. M. Larson, H. A. Fricker, and S. Tulaczyk (2017), Snow accumulation variability on a West Antarctic ice stream observed with GPS reflectometry, 2007–2017, Geophys. Res. Lett., 44, doi:10.1002/2017GL074039. Key, K., & Siegfried, M. R., (2017). The feasibility of imaging subglacial hydrology beneath ice streams with ground-based electromagnetics. Journal of Glaciology, 1-17. doi:10.1017/jog.2017.36. Carter, S. P., Fricker, H. A., and Siegfried, M. R. (2016), Antarctic subglacial lakes drain through sediment-floored canals: theory and model testing on real and idealized domains, The Cryosphere, 11, 381-405, doi:10.5194/tc-11-381-2017, 2017. Siegfried, M. R., Fricker,H. A., S. P. Carter, and S. Tulaczyk (2016), Episodic ice velocity fluctuations triggered by a subglacial flood in West Antarctica, Geophys. Res. Lett., 43, 2640–2648, doi:10.1002/2016GL067758. Jacobel, R. W., K. Christianson, A. C. Wood, K. J. DallaSanta, and R. M. Gobel (2014), Morphology of basal crevasses at the grounding zone of Whillans Ice Stream, West Antarctica, Annals of Glaciology, 55(67), 57–63, doi: 10.3189/2014AoG67A004. Siegfried, M. R., H. A. Fricker, M. Roberts, T. A. Scambos, and S. Tulaczyk (2014), A decade of West Antarctic subglacial lake interactions from combined ICESat and CryoSat-2 altimetry, Geophysical Research Letters, 41, 891–898, doi: 10.1002/2013GL058616. Carter, S. P., H. A. Fricker, and M. R. Siegfried (2013), Evidence of rapid subglacial water piracy under Whillans Ice Stream, West Antarctica, Journal of Glaciology, 59(218), 1147–1162, doi: 10.3189/2013JoG13J085. Christianson, K., B. R. Parizek, R. B. Alley, H. J. Horgan, R. W. Jacobel, S. Anandakrishnan, B. A. Keisling, B. D. Craig, and A. Muto (2013), Ice sheet grounding zone stabilization due to till compaction, Geophysical Research Letters, 40, 5406–5411, doi: 10.1002/2013GL057447. Horgan, H. J., K. Christianson, R. W. Jacobel, S. Anandakrishnan, and R. B. Alley (2013), Sediment deposition at the modern grounding zone of Whillans Ice Stream, West Antarctica, Geophysical Research Letters, 40, 3934–3939, doi: 10.1002/grl.50712. Horgan, H. J., R. B. Alley, K. Christianson, R. W. Jacobel, S. Anandakrishnan, A. Muto, L. H. Beem, and M. R. Siegfried (2013), Estuaries beneath ice sheets, Geology, 41(11), 1159–1162, doi: 10.1130/G34654.1. Muto, A., K. Christianson, H. J. Horgan, S. Anandakrishnan, and R. B. Alley (2013), Bathymetry and geological structures beneath the Ross Ice Shelf at the mouth of Whillans Ice Stream, West Antarctica, Journal of Geophysical Research: Solid Earth, 118, 4535–4546, doi: 10.1002/jgrb.50315. S.P. Carter, Helen A. Fricker. The supply of subglacial meltwater to the grounding line of the Siple Coast, Annals of Glaciology, 53, (60), doi: 10.3189/2012AoF60A119. Priscu, J.C., A. Achberger, J. Cahoon, B. Christner, R. Edwards, W. Jones, A. B. Michaud, M. Skidmore, G. Switzer, R.H. Spigel, S. Tulaczyk, T. Vick-Majors. 2012. Clean access to the subglacial environment associated with the Whillans Ice Stream. Antarctic Science. In review. Barletta, R.E., J.C. Priscu, H.M. Mader, W.L. Jones and C.W. Roe. 2012. Chemical Analysis of Ice Vein µ-Environments II – Analysis of Glacial Samples from Greenland and the Antarctic. J. Glaciology, In Press. Christner, B.C., G.G. Montross, and J.C. Priscu. 2012. Dissolved gases in frozen basal water from the NGRIP borehole: implications for biogeochemical processes beneath the Greenland ice sheet. Polar Biology, doi 10.1007/s00300-012-1198-z. Priscu, J.C. and K.O. Hand. 2012. The microbial habitability of extraterrestrial icy worlds: A view from Earth. Microbe 7: 167-172. Fricker, H.A., R. Powell, J, C. Priscu, S. Tulaczyk, S. Anandakrishnan, B. Christner, D. Holland, H. Horgan, R., J.Mikucki, A. Mitchell, R. Scherer, J. Severinghaus. 2011. Siple Coast Subglacial Aquatic Environments: The Whillans Ice Stream Subglacial Access Research Drilling (WISSARD) project. In Subglacial Antarctic Aquatic Environments (M. Siegert, C. Kennicutt, B. Bindschadler, eds.). AGU Geophysical Monograph Series 192. Washington DC. ISBN 978-0-87590-482-5. Mowlem, M.C., M.-N. Tsaloglou, E.M.W., C.F.A. Floquet, K. Saw, L. Fowler, R.Brown, D.Pearce, J. B. Wyatt, A. D. Beaton, M. P. Brito, D. A. Hodgson, G. Griffiths, M. Bentley, D. Blake, H. Campbell, L. Capper, R. Clarke, C. Cockell, H. Corr, W. Harris, C. Hill, R. Hindmarsh, E. King, H. Lamb, B. Maher, K. Makinson, J. Parnell, J. Priscu, A. Rivera, N. Ross, M. J. Siegert, A. Smith, A. Tait, M. Tranter, J. Wadham, B. Whalley, and J. Woodward. 2011. 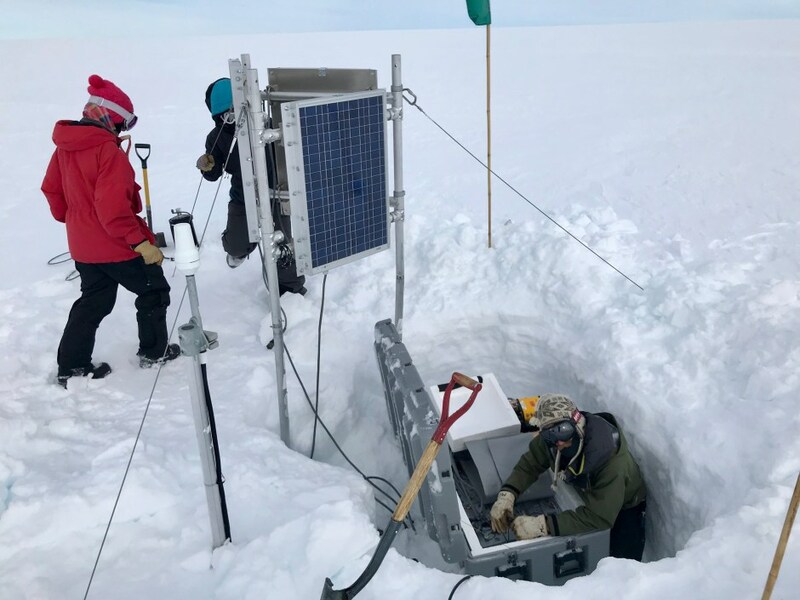 Probe Technology for the Direct Measurement and Sampling of Ellsworth Subglacial Lake. In Subglacial Antarctic Aquatic Environments (M. Siegert, C. Kennicutt, B. Bindschadler, eds.). AGU Geophysical Monograph Series 192. Washington DC. ISBN 978-0-87590-482-5. Ross, N, A. Rivera, M.J. Siegert, M. Bentley, D. Blake, H. Campbell, L. Capper, R. Clarke, C. Cockell, H. Corr, W. Harris, C. Hill, R. Hindmarsh, D. Hodgson, E. King, H. Lamb, B. Maher, K. Makinson, M. Mowlem, J. Parnell, D. Pearce, J.C. Priscu, A. Smith, A. Tait, A., M. Tranter, J. Wadham, B. Whalley, and J. Woodward. 2011. Subglacial Lake Ellsworth, West Antarctica: its history, recent field campaigns and plans for its exploration. In Subglacial Antarctic Aquatic Environments (M. Siegert, C. Kennicutt, B. Bindschadler, eds.). AGU Geophysical Monograph Series 192. Washington DC. ISBN 978-0-87590-482-5. Priscu, J. C., R. D. Powell, and S. Tulaczyk. 2010. Probing Subglacial Environments Under the Whillans Ice Stream, Eos Trans. AGU, 91(29), 253, doi:10.1029/2010EO290002. Wadham, J.L., Tranter, M., Skidmore, M., Hodson, A.J., Priscu, J.C., Lyons, W.B., Sharp, M., Wynn, P., Jackson, M. 2010. Biogeochemical weathering under ice: size matters. Global Biogeochemical Cycles, Vol 24, GB3025, doi:10.1029/2009GB003688. H.A. Fricker, D.M. Holland, R.W. Jacobel, J. Mikucki, A.C. Mitchell, R.D. Powell, J.C. Priscu, R.P. Scherer, J.P. Severinghaus, “Whillans Ice Stream Subglacial Access Research Whillans Ice Stream Subglacial Access Research Drilling (WISSARD): Integrative Study of Marine Ice Sheet Stability and Subglacial Life Habitats” , bibl. EOS Transactions American Geophysical Union 90 (52), Fall Meet. Suppl., Abstract U53C-03, (2009). Lanoil, B., M. Skidmore, J. C. Priscu, S. Han, W. Foo, S. W. Vogel, S. Tulaczyk, and H. Engelhardt. 2009. Bacteria beneath the West Antarctic Ice Sheet. Environmental Microbiology 11(3), 609–615. Priscu, J.C. and C.M. Foreman. 2009. Lakes of Antarctica. p. 555-566 in G.E. Likens (ed.) Encyclopedia of Inland Waters volume 2. Oxford: Elsevier Press. 6492 pp. Hodson, A., A.M. Anesio, M. Tranter, A. Fountain, M. Osborn, J. C. Priscu, J. Laybourn-Parry, B. Sattler. 2008. Glacial ecosystems. Ecological Monographs, 78(1), 41–67. Priscu, J.C., S. Tulaczyk, M. Studinger, M. C. Kennicutt II, B.C. Christner, and C.M. Foreman. 2008. Antarctic Subglacial Water: Origin, Evolution and Ecology. In: W. Vincent and J. Laybourn-Parry (eds. ), Polar Lakes and Rivers. Oxford University Press. Pp. 119-135. Christner, B.C., M.L. Skidmore, J.C. Priscu, M. Tranter, and C.M. Foreman. Bacteria in subglacial environments. 2008. In R. Margesin, F. Schinner, J.-C. Marx, and C. Gerday (eds. ), Psychrophiles: From Biodiversity to Biotechology. Springer, New York. Pp. 51-71. The Lake Ellsworth Consortium – A. Behar, M. Bentley, D. Blake, P. Christoffersen, C. Cockell, H. Corr, D.C. Cullen, H. Edwards, A. Ellery, C. Ellis-Evans, G. Griffiths, R. Hindmarsh, D.A. Hodgson, E. King, H. Lamb, L. Lane, K. Makinson, M. Mowlem, J. Parnell, D.A. Pearce, J. C. Priscu, A. Rivera, M.A. Sephton, M.J. Siegert, M.R. Sims, A.M. Smith, M. Tranter, J.L. Wadham, G. Wilson, J. Woodward. 2007. Exploration of Ellsworth Subglacial Lake: a concept paper on the development, organisation and execution of an experiment to explore, measure and sample the environment of a West Antarctic subglacial lake. Rev. Environ. Sci. Biotechnol. 6:161–179. doi: 10.1007/s11157-006-9109-9. Also published in Life in Extreme Environments, Amils, R., Ellis-Evans, C. and Hinghofer-Szalkay, H.G (eds), Springer, Dordrecht, the Netherlands, 25-44 (2007). Priscu, J.C., B.C. Christner, C.M. Foreman and G. Royston-Bishop. 2007. Biological Material in Ice Cores. Encyclopedia of Quaternary Sciences. Volume 2. (Editor in Chief, S.A. Elias). p. 1156-1166. Elsevier B.V., UK. Priscu, J.C., M.C. Kennicutt II, R.E. Bell, S.A. Bulat, J.C. Ellis-Evans, V.V. Lukin, J.-R. Petit, R.D. Powell, M.J. Siegert and I. Tabacco. 2005. Exploring subglacial Antarctic lake environments. EOS, Transactions of the Geophysical Union. Vol. 86, No. 20: 17,193-17,197. Christner, B.C. and J.C. Priscu. 2005. Subglacial Lake Vostok. Encylopedia of Water. Wiley Intersciences. Royston-Bishop G., Priscu J.C., Tranter M., Christner B., Siegert M.J., Lee V. 2005. Incorporation of particulates into accreted ice above subglacial Lake Vostok, Antarctica. Annals of Glaciology 40: 145-150.